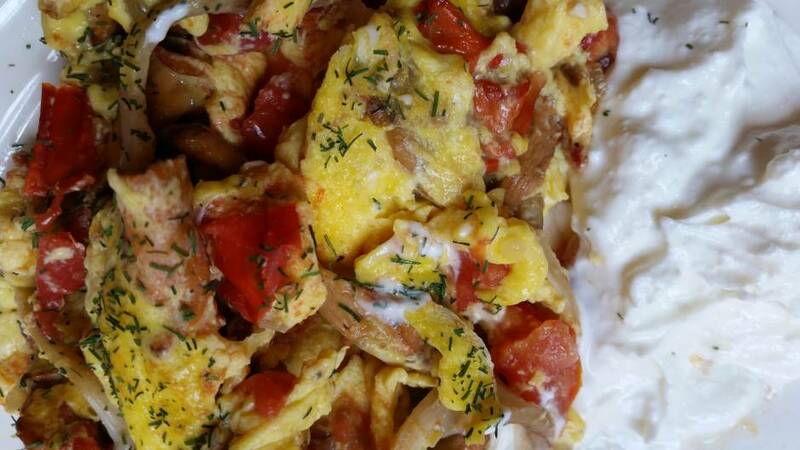 Foraged chanterelles, cultivated oysters, homemade yogurt cheese, homegrown tomatoes, and farm fresh free range eggs create a delicious and healthy breakfast! 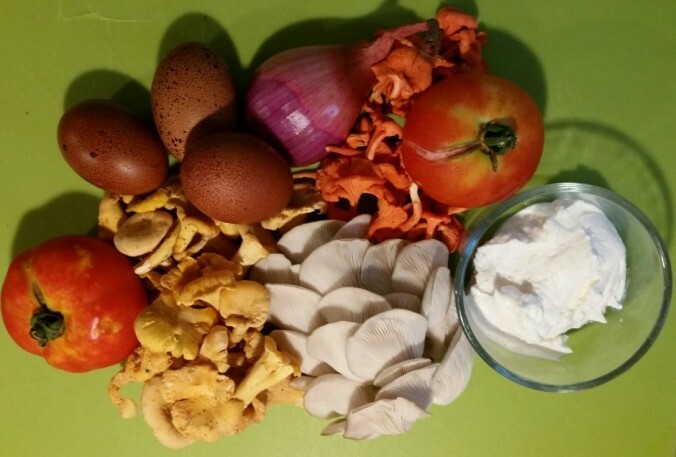 July 31, 2015 / Amy Fox / Comments Off on Why Make Mushrooms a Part of Your Daily Diet: The Amazing Health Benefits, That’s Why! When most people think of the word mushroom, the first thing that comes to mind is the common white button mushroom. Most are not aware of the diverse number of varieties of edible mushrooms that are available because grocery stores typically carry only white button, Crimini, and Portabella mushrooms . All of the aforementioned mushrooms are the same species, Agaricus bisporus, except Crimini and Portabella are a brown strain of A. bisporus. To make it more interesting, Crimini and Portabella are actually the same mushroom, just at differing levels of maturity. The mushroom sold as Crimini is the brown variant that has been harvested before the the cap has opened to expose the gills. The converse is true for Portabella with the cap being allowed to mature fully, open, and expose the gill structure. Bet ya didn’t know that, huh! 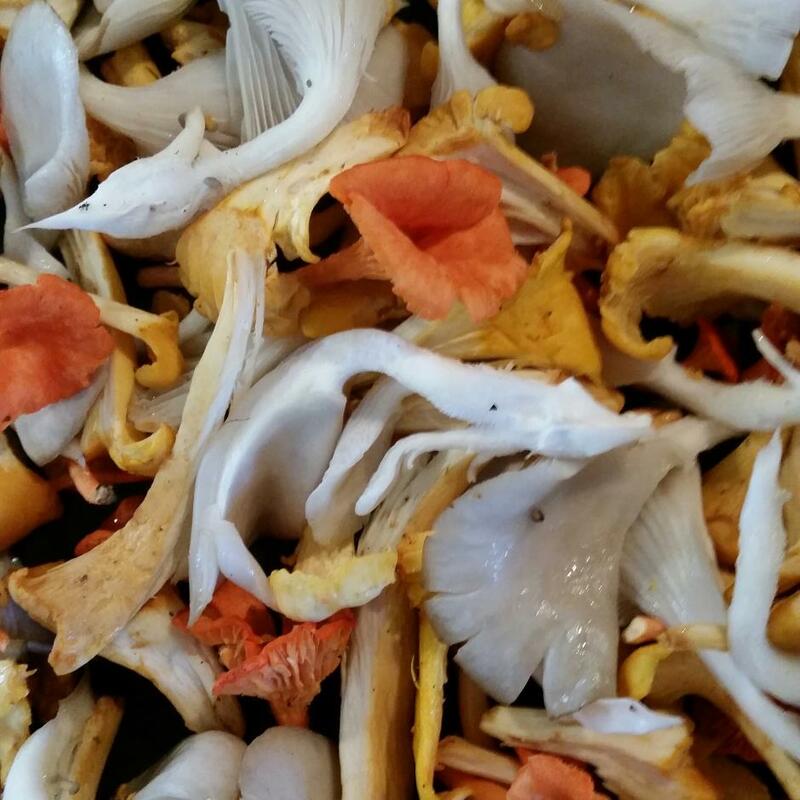 A mixture of foraged chanterelles and cultivated oyster mushrooms ready to be sauteed to perfection. I say, “common” white button mushroom, but there is nothing common about it. See the links to articles, websites, and reports at the bottom to see what healthful benefits this “common” superfood contains. Not only do white button mushrooms contain health-promoting components, so do many other edible and medicinal mushrooms. Mushrooms in general are well known to possess qualities conducive to good health but some provide very specific benefits. Read on to learn more. To expose yourself to the array of numerous shroomy options available out there, check out your local food specialty stores, higher end grocers, and farmers’ markets. Yes, you can find differing species at Asian markets as well but I encourage you to purchase mushrooms that are locally grown as much as possible. This is important because cultivation and processing laws in other countries do not match that of those in the US. 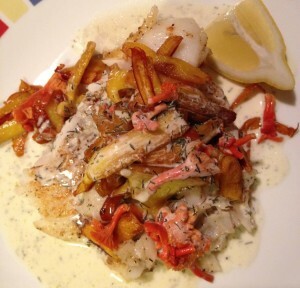 In addition, local products are associated with greatly decreased transit times and equate to a fresher product. Foraged scaley birch boletes and cinnabar chanterelles in a lemon dill cream sauce over cod. Some of the cultivated species available that not only will expand your palate but offer you immense health benefits are: oyster mushrooms, chanterelles, hen of the woods (cultivated specimens are much smaller than wild), shiitake, and Lion’s Mane, to name a few. Please click on each of the links for the names mushrooms in order to obtain more information. Yes, some of these are Wikipedia links but they include nutritional info for all but the Lion’s Mane, as well as provide references for the information documented. This brings me to the entire point of this article. People repeatedly ask me why I love mushrooms so much. In addition to the fact that they are just plain delicious, with a variety of textures and flavors available, I am absolutely in awe of mushrooms and the powers that lie within them. Past, current, and continuing research is demonstrating the tremendous health benefits that mushrooms offer. Not only are they chock full of vitamins and minerals, they also contain substances that fight and prevent cancer, assist in weight loss, help to control blood sugar in diabetics, improve immune response, have cognitive/neuroregenerative effects, lower cholesterol, assist to maintain a healthy blood pressure, decrease inflammation….the list goes on and on. I am not a fan of rewriting something that has previously been done so perfectly. Therefore I am providing the following links to answer all of your burning questions regarding how mushrooms are truly beneficial from a health/medical standpoint. I will say that I do not believe everything I read and nor should you. Only obtain your information from reputable sources such as peer-reviewed journal articles and well respected educational sites. The links I have provided are either journal articles themselves or are articles/reports that are based upon the aforementioned criteria and site their sources. 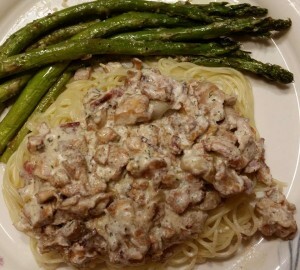 Bacon chanterelle cream sauce over pasta with a side of roasted asparagus. Yes, you may notice that Dr. Roupas is listed as an author on both the article and the report. I am not biased nor am I trying to provide you a narrow perspective. Quite the opposite. When searching for all-encompassing sources on the topic at hand I discovered the Science of Mushrooms and Health Website after I had already discovered the article below. After hours of research, I concluded that regardless of the fact that Dr. Roupas is listed on both documents, they truly were the most thorough and comprehensive compilations of info, utilizing reliable scientific sources. Please feel free to do your own research. Mushrooms – Biologically Distinct and Nutritionally Unique. Feeney, Miller, and Roupas provide a well-written article with a focus on the nutritive benefits of mushrooms. Medical applications are discussed as well. Mushrooms and Health 2014: Clinical and Nutritional Studies in Humans. This comprehensive report, created by Roupas, Krause, and Taylor, documents studies that have been done and are slated to be done with respect to the effects of mushrooms on human health. I appreciate the fact that this report is unbiased, reporting studies that are both supportive of the positive healthful effects of fungi as well as those that have been inconclusive. It is a long read at 156 pages long but well worth the time if you are truly interested in the unique components and qualities that mushrooms harbor. If after reading this report you are not convinced that you need to add mushrooms to your daily diet to maintain your health and prevent and fight illness/disease, I do not know what will! An omelette created with the ingredients pictured at the beginning of the article. Delicious!!!! Also, thepowerofmushrooms.com is a great website with a lot of the health-related info contained in the above article and report but written in layman’s terms.